Edmond C. Fleet (1902-1983) was a civilian pastry chef for the United States Navy, who found significant ways to put his organizing talents to good use for the Nauck community. Besides being a member of the local African-American Elks Lodge, Masonic Lodge, and Oddfellows, he was a co-founder of the Veteran’s Memorial Branch of the YMCA, located at 3440 22nd Street S, one block away from Macedonia Baptist Church. Built in 1953, the Veteran’s Memorial YMCA served the “non-white” residents of the county. Located near Drew School, it naturally had a strong bond with the children of Nauck, especially since the county’s Parks and Recreation system was still segregated. In the late 1950s, this YMCA started a campaign to build a swimming pool as there were no pools in the County that would allow African-Americans in. Front page of mailer asking for donations for construction of Veteran's Memorial YMCA pool. Third page of mailer sent out to get contributions for construction of the Veteran's Memorial YMCA swimming pool. This 1962 pledge brochure, which lists Fleet as a member of the Advisory Committee, details plans for the pool and asks for community support. Fleet put his money where his mouth was, and donated money to the YMCA and other organizations in which he was involved, including Mt. Zion Baptist Church where he was in the choir. 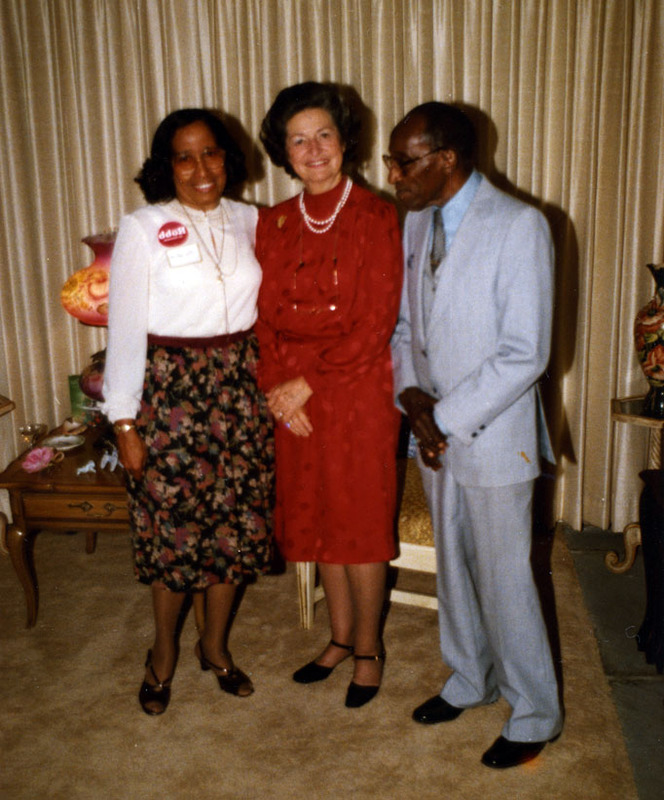 Lady Bird Johnson flanked by Edmond C. Fleet and an unidentified Robb supporter, 1977. To learn more about Edmund C. Fleet and the Veteran’s Memorial YMCA, visit the Center for Local History on the first floor of the Central Library. Do you have a question about this story, or a personal experience to share? Use this form to send a message to the Center for Local History. Do you have a question about this story, or a personal experience to share? Use this form to send a message to the Center for Local History. The Cherrydale Branch Library parking lot will be closed for re-striping on Tuesday, April 9. We apologize for any inconvenience this will cause. Street access and street parking to the Library will not be affected. Be prepared by bringing the necessary documents with you. Spanish speaking volunteers are available at both Library locations. Tax Preparation Clinics are presented in partnership with AARP and the Arlington County Department of Human Services. Are you on hold to read Arlington Reads Signature Author Susan Orlean's new book, "The Library Book"? Here are some other great nonfiction authors to explore while you wait, whose work remind us of Orlean's writing. About "The Book Woman of Troublesome Creek"
"In The Book Woman of Troublesome Creek, author Kim Michele Richardson weaves together two real things – the Blue People of Kentucky and the Pack Horse Librarians – into one authentic work of historical fiction. With lyrical language, the author develops a strong sense of place and atmospheric tone that brings the difficulties and realities of Depression-era Kentucky to life. But what is most memorable is Cussy Mary, the novel’s main character, who endures racism and abuse while trying to save those around her in any quiet way she can. Troublesome Creek is a great read for those who enjoyed Beartown and Major Pettigrew’s Last Stand." Reviewed for you here by librarian Sarah. Publication date is set as May 7, 2019. Leave a comment below on Wednesday, April 3, and share the name of the book you're reading this week. Everyone who leaves a comment here, on Facebook OR Twitter will be entered into a random drawing (Library employees are not eligible). Please only enter in one place. The winner will be contacted by email on Thursday, April 4. The winner can pick up their prize at the Library location of their choice. Win a Book Wednesdays takes place twice a month. Prize books are Advance Reader Copies (ARCs) of books that will be added to the Library collection within the next month, and can already be found in the Library catalog as "on order." ARCs are uncorrected proofs given to the Library for review purposes only, and are not for sale. This will be the final Win a Book Wednesday. Library staff will return with a new book review series in the fall of 2019. Now you can make a suggestion for the Library collection, from inside your Library account. You can also track the status of your suggestions from a handy dashboard. It is our goal to respond to every request placed through the form within 5 business days. Due to the volume of suggestions, that may not always be possible. The Library welcomes suggestions for new materials, and purchases items recommended by patrons whenever possible. Individual purchase decisions will be guided by the Library's selection policy and availability of funds. Log into your Library account and click on Materials Request in the left sidebar. A valid Arlington library card is required. Patrons may suggest 60 items per year, and have up to 5 active requests open at any time. Title or author suggestions are welcome. Provide as much information as possible. Include reviews or sources if available. Log into your Library account and click on Materials Request in the left sidebar. Click on the Details button to the right of each request to view its status. Please note: If you submitted Materials Purchase Requests prior to April 1, 2019, you will not see them reflected in your Library account. While every suggestion will be considered, the Library can not buy every suggested title. Library staff do not place holds at the time of request. If a title suggested for addition to the collection is approved, the responsibility is on the patron to place their own holds. The Library is unable to respond to Materials suggestions outside of this form (email, phone call, etc.). The Glencarlyn Branch Library parking lot will close for repaving from 5 p.m. on Saturday, March 30, through 12 p.m. on Tuesday, April 2. We apologize for the inconvenience this will cause to patrons. Access to the Library will not be affected, and street parking will continue to be available. Did you know that today - Thursday, March 28, 2019 - is the earliest Opening Day in the history of Major League Baseball? These pages are from a Washington Nationals game against the Chicago White Sox on July 16, 1912, attended by a member of the Olcott family from the Glencarlyn neighborhood. The first page has the 1912 American League schedule and 1911 standings, while the second page has a score card and roster for the competing teams. The Washington Nationals/Senators beat the Chicago White Sox 7-2 in the July 16 game and finished second in the 1912 American League, losing the Pennant to the Boston Red Sox. The Washington area may have a fraught history when it comes to baseball teams, but that has not stopped Arlingtonians from cheering for our local team - whatever their name may be. The Washington Senators—one of the American League’s charter teams—was founded in 1901. In 1905, the team officially changed its name to the Washington Nationals, but was still commonly referred to as the “Senators” until it relocated to Minnesota in 1961, where it became the Twins. The original Nationals/Senators team was almost immediately replaced with another American League team, this time officially named the Washington Senators. The Senators lasted for a decade (1961-1971) before moving to Texas as the Texas Rangers. In 2005—33 years after the Senators departed for Texas—Major League Baseball finally returned to the Washington area, this time as part of the National League and as the Washington Nationals. So go out this weekend and cheer for your favorite team. We’ve got our Nats caps ready! To see more items like these, or to learn more about Arlington's history, visit the Center for Local History on the first floor of the Central Library.